As the Christmas slowdown comes to an end it’s time to start thinking about the year ahead. January can be a slow month so it’s the perfect time to get your business priorities in order. Read on to find out how you can make sure your business is taking the rights steps for a successful 2015. Resolutions don’t just have to be personal; you can also make pledges on behalf of your business for the year ahead. Reflect on 2014 and think about what didn’t go as well so you can decide what you want to do differently. 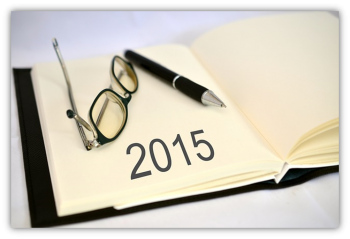 Think about things you want to achieve in 2015 and articulate how you will achieve them. Goals are more easily defined if we make them “SMART” – specific, measurable, achievable, realistic and timely. Without these definitions your 2015 goals could very easily become your 2015 failures. Once you have had time to reflect on the year gone by, and have developed resolutions for the year ahead, you will be ready to revisit your Business Plan. You have already taken the time to create a complex and detailed business plan so to make sure it retains its value, a business plan should constantly evolve. Plan in regular revisits and be sure to take into consideration changes both internally (e.g. staff changes) and externally (e.g. changes to legislation). There are several reasons that training and development should be high up on the agenda for your business. Not only does investing time in your team keep them motivated, it also gives you the freedom to move staff into other roles more easily should the need arise. Don’t forget about yourself. It’s crucial to progress your own professional development. Challenge yourself; learn new skills, read relevant articles. In terms of your business, it can be tempting to “make do” with things as they are, but this is only putting off the inevitable and potentially putting your business at a disadvantage in the process. Investment doesn’t necessarily need to mean parting with large lumps of cash – take the time to make sure your business processes are the best they could be. If you are still relying on paper systems to run your business then it is time to invest in cloud software. It is predicted that businesses who fail to adopt cloud computing into their business will soon be in the minority. The cloud is here to stay. Whether you consider your online presence to be suitable or if it is non-existent, now is the time to reassess you current strategy. If you spend minimal time on things like a website, social media or blogging you could be selling your business short. No matter what you’re selling there are benefits to be had from making yourself known online. If you have a website, social media accounts or are already a keen blogger then take this opportunity to have a refresh. Check all information and images etc. are up-to-date. Think about the year ahead and how you want to develop your online branding. Incorporate it into your resolutions and business plan. Get organised both physically and electronically. Clear the clutter and get rid of anything that doesn’t need to be kept. Shred paperwork and file away documents into the relevant place. Apply this to your desktop too. Old, obsolete files need deleted and spend some time organising and archiving your computer folders. Encourage your employees to do the same if applicable. By starting with a clear desk and PC you will make for a much more efficient 2015.